Beancurd is one of my comfort foods. 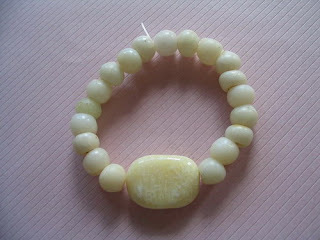 The texture and color of the central bead on this bracelet is so soft and silken it resembles a piece of tofu. Its flat shape is just what I like to use in my composition of bracelets. This bead came to me as a gift all the way from Alaska, my dream land, mmmm! According to the donor it is made from fossil walrus ivory from the inner part of the tusk. The accompanying spherical whitish beads are made from ancient glass and come from Vietnam. I was told by the seller that it originated in the Champa Dynasty ( 7th-15th Century AD) but I have no hard research to back up this statement. Only my gut feeling, my sense of touch and sight seem to indicate these are indeed ancient. Wow, think I will wear this tofu beauty to my nephew's wedding party next month...but I just heard that it is gonna be a "formal" affair. Argh !! not exactly my kind of scene and I think tofu beauty would also feel out of place at a gala.